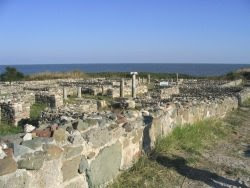 Most of the important cities on the shore of the Black Sea, in the Dobrogea area were once mighty fortresses created by Greek colonists or stationing points for the Roman army. Before the Ottoman Empire expanded and before their influence left a mark on local culture, the left side of the Danube river was a prosperous and beautiful area, where many great cities and citadels were born. Some historians compared Histria to the famous Pompey, only that it lacks the tragic fate and the hellish volcano. Histria was the first Greek colony on the Western Shore of the Black Sea and it’s considered the oldest city in the current Romanian territory. Historian Eusebius claims that the city was founded back in 654 BC by colonists from Milet. This colony constantly evolved for about 1300 years, back from when Greece was the cradle of civilization and till the romano-bizantine era. As the Slavish and Avar peoples invaded the area in the 6th and 7th century people started deserting the citadel. The ruins of the once beautiful Histria were discovered in 1914 by Vasile Parvan, local archaeologist. One of the most important areas of the old city was the histrian acropolis, on top of which the newer section of the city was built. The acropolis was a sacred area, where religious activies took place and people gathered to worship Zeus and Afrodites.Aristotel mentions in his works that Histria was under a democratic rule and part of the Athenian maritime league. The flourishing commerce allowed the city to have its own currency.Eventually, Histria was swallowed by the Roman Empire, after a brief rule under king Burebista, the Dacian. The inclusion of the city in the Empire was done with the aid of the military campaign led by M. Licinus Crassus. Archaeologists revealed a late roman part of the settlement that included the main gate and defense towers. Tourists can visit this segment, the two antique therme (baths) and a couple of public edifices from the roman–bizantine era. The Tropaeum Traiani citadel is situated near the Adamclisi village, about 70 km south-west of Constanta. The famous triumphal monument is situated in the north side of Adamclisi on the Monument Hill, a 161 metres tall plateau, surrounded by three important locations: the altar preserved to this day in the shape of a "tumul" (50 metres north), the mausoleum and the Tropaeum Traiani citadel. The latter can be found on the Valley of Urluiei, 1.5 km south west of the monument, close to the Bucharest-Constanta national highway. Just as you enter the Adamclisi village, you'll see the walls of the antique defensive structure and its towers, that have been renovated between 1971 and 1977. Tropaeum Traiani was built in 106-109 AC and it was meant to pay a tribute to Emperor Traian's victories over Dacians, their sarmatian allies and the germanic tribes in the first Dacian war. The beautiful monument is made of stone and it was created by Apollodor from Damascus. The monument includes a trophy, shaped like a roman officer's armour, who is dressed in a Greek "lorica". 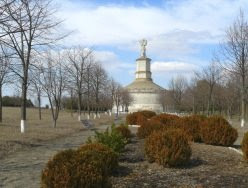 The military funeral altar is shaped like a prism, but to the day only a couple of pieces were kept from it and fragments of the original inscriptions which mentioned the name of 3800 soldiers who had died on the battlefield.In the year 170 AC the citadel was destroyed by the invasion of Costoboci, but the main wall was rebuilt during the rule or Constantine the Great and Licinius.During the roman-bizantine period, Tropaeum Traiani developed economically thanks to the support of emperors Anastasius and Justin. All the edifices and remains you can visit today, dates from the roman-bizantine period (IV-VIth century a C). In order to access the inner citadel, you’ll have to enter through the eastern gate, using the via principalis. Inside you’ll be able to visit numerous public edifices and religious ones, like the basilica forensic, basilica cisterna, houses, shops, aqueducts etc. The original parts of the triumphant monument, as well as important archaeological artefacts can now be found at the Adamclisi museum, where they are showcased. Archaeologists and historians have proved that the first Greek settlements in the peninsular area of Constanta were founded sometime around the 6th century b C. During the successful reign of the Greeks, the Tomis colony grew, as far as importance was concerned and so did its wealth. The latter allowed the inhabitants of the city to build public edifices, like elegant baths, or aqueducts made form stone or marble. The situation of the colony changed drastically around the first century before Christ, as Romans appeared in the area and gained authority over the local settlements. In 55 BC, the Dacian king Burebista took over the rule of these colonies till his death in 44 BC.Most of the info we have on Tomis comes from roman poet Ovid, who spent 8 years exiled in this city (9-17 AC), at the orders of Roman emperor Octavian Augustus. The poet died in the year 17 and is buried at the city’s gate (ante oppidi portam).In the following years, a couple of administrative decisions help create the Moesia Inferior province, which is basically the actual Dobrogea. Tomis became a sort of capital for this province and knew a great urban growth and prosperity. In the third century AC, the invasion of carps and Goths threatened the elegant city of Tomis, considered the most beautiful capital on the left side of the Danube river, according to the historians of those times. Tomis had also become a religious core of the area, when Christianity became the official religion of the empire, during the rule of Constantine the Great. During the bizantine period, (8th – 12th century), Tomis was also known as Constantiana or Constanta, a name that was taken from the imperial family that ruled in the 4th AC.The most important touristic objectives you can visit in Tomis/Constanta are: the main wall of the Tomis citadel, which you can find along the Ferdinand Boulevarad, the Roman edifice with a Mozaic, found in Ovid Square, the therme (baths), found on the west side of Constanta and the antique urban area of the Cathedral Park. The latter displays 12 archaeological levels, that show a period of almost a millennium of the town’s history and also prove its existence in the sixth century a C.Numerous archaeological artefacts can be seen at the National Museum of History and Archaeology, in Constanta, Ovid Square no 12. Where once stood the antique Greek city Callatis is now the Mangalia city, 44 km south of Constanta. Callatis was a Greek colony founded by the people who came from the megarian center of Pontic Heracleea, probably at the end of the 6th century BC.Callatis is mentioned by great writers and historians like Ptolemy, Strabo, Memnon and Ovid. The first Greek necropolis dating from the 4th-2nd centuries BC includes graves that were very varied, as far as rituals and markings go. One of the most important tombs found in the Callatis necropolis is “the papyrus one”, discovered in 1959, covered with 3 stone plates and made out of big blocks of limestone.Among the famous archaeological discoveries of the city you’ll find the site wall, the Syrian basilica, the papyrus grave, which you can visit at the Callatis Museum. 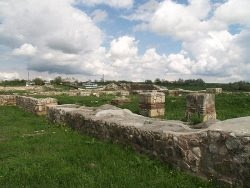 The Capidava citadel was built on what is now that highway that links Harsova with Cernavoda, at the middle of the distance between the two settlements. Capidava is part of the many castres and castles built by Roman emperor Traian at the beginning of the second century AC. Capida is a getic name, meaning “the citadel at the turning point”, which confirms the existence of a preroman settlement. This was a military settlement, where roman troops were stationed and this status was kept for about 5 centuries. After the bizantine Empire was reorganized, Capidava became a peasant fortress, built over the ruins of the roman fortifications. Its inhabitants were mostly frontier guards.